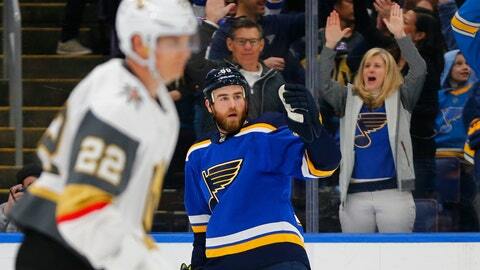 ST. LOUIS (AP) — The St. Louis Blues paid a big price to obtain Ryan O’Reilly and it’s already looking like a bargain. O’Reilly, Ivan Barbashev and Zach Sanford scored to help the Blues beat the Vegas Golden Knights 3-1 on Monday night. St. Louis acquired O’Reilly from the Buffalo Sabres last offseason for a 2019 first-round draft pick, a 2021 second-round pick plus Tage Thompson, Vladimir Sobotka and Patrik Berglund. Buffalo never made the playoffs in O’Reilly’s three seasons there. He reached the playoffs twice with Colorado, the last time during the 2013-14 season. Now he’s on the cusp of getting back into postseason play with the Blues. Las Vegas goalie Malcolm Subban, making his fifth straight start, threw the puck behind the net but Sanford was there to control it. He skated out and fed Barbashev in the bottom of the right circle. Barbashev threaded his wrist shot between Subban’s arm and body with 1:19 left in the period. St. Louis regained the lead on O’Reilly’s 27th goal when he snapped in a wrist shot from the left circle at 18:14 after taking a pass from Bouwmeester. Bouwmeester gave O’Reilly all the credit. NOTES: Golden Knights G Marc-Andre Fleury and LW Max Pacioretty remain day-to-day with lower-body injuries. … Vegas D Shea Theodore and C Pierre-Edouard Bellemare were late scratches. … Blues D Carl Gunnarsson returned to the lineup after being out with an upper-body injury since Feb. 5. He missed 24 games. … Ex-Blues player Paul Stastny was back on the ice in St. Louis for the first time since leaving. … Blues RW Vladimir Tarasenko needs one goal for his fifth straight 30-goal season. … The Blues improved to 11-2-0 in their last 13 home games after a 10-13-2 start.